The ability to play 3 independent melodic lines, one each in the right hand, left hand, and feet, accurately and cleanly in perpetual 8th note or 16th note motion, anywhere on the keys, with the feet doing everything the hands are doing while sweeping across the entire compass of the pedalboard, is a technical skill that all organists should strive to attain. Bach was so aware of this that he wrote 6 so-called Trio Sonatas for 2 manuals and pedals for the instruction of his eldest son as the boy became old enough finally for his feet to reach the pedals. Never in these works, as with all trios, are there more than 3 notes sounding, simultaneously. These 18 compositions (each of these Trio Sonatas contains 3 pieces) however are not easy for most students to digest their way through, so much so that many teachers do not even assign them to their students until they work their way through an easier trio or two as a stepping stone to the study of Bach's collection. Playing trios like this evenly and cleanly is not as easy as it seems; it takes practice, concentration, and determination, but the rewards are great. As you're writing skills continue to develop, you might entertain trying your hand at writing a trio like this for yourself to first challenge your imagination and craftsmanship in constructing imitations and afterwards to help keep your playing skills sharp. Contrary motion always between the parts is the objective, with oblique motion (something stationary while something else is moving) being preferred to similar motion. There are times however that similar motion is desired; as always, if it's written into the score, it should always be with good reason and limited for the most part. Typically, we avoid crossing voices in everything we write, including trios, and keep the voices in proper order from highest to lowest. In the case of a trio the left hand generally works the tenor line but is also free, at times, to work both alto and tenor if the soprano line, momentarily, happens to be slightly more than an octave away from the alto and the right hand stretch for a small hand is insufficient to play it any other way. Generally however, we strive to keep 2 adjacent voices from traveling further than an octave away from each other, the only exception being the bass line, which is permitted to descend much further than an octave below the tenor. As for crossing of voices, on RARE occasions this too is justified if it improves voice leading ... OR ... as in the case of this Trio, if the work serves as a study or etude in technique which teaches the entire pedalboard as well as the manuals; the line for the feet, in this case, will deliberately travel very high on the pedals and unavoidably cross the left hand line in several places. This is the purpose of Trio in Eb Major Op. 14 (photo), to teach the performer how to play this way in 3 independent parts very high on the pedalboard and to address the hardest thing about organ playing, which is getting the left hand and feet to move independently anywhere on the keys and in exact time with the right hand [See blog, What About The Piano, Part IV, The Hardest Thing]. This work, like all trios in this form, is not easy; it is in fact quite difficult because, while it takes the music only through the 5 nearest keys, it proceeds at a fast clip, keeps the hands on different manuals, and has the feet moving all over the pedalboard from low C to high (middle) Eb; a pedalboard extending at least that high will therefore be needed to perform this work. Quick sounding stops at 8-foot pitch should be chosen for all 3 moving lines, including the Pedal; flute tone works well for the right hand and Pedal parts. A stop with a contrasting timbre such as a color reed (Oboe, Orchestral Oboe, Clarinet, Cromorne, Cor Anglais, etc., whatever the instrument has) should be drawn on the manual used by the left hand. This is because the left hand part and Pedal part cross in several places, and contrasting tone colors will help the ear keep track of them. If the instrument has an 8-foot Trumpet stop, and it isn't voiced too assertively, this might also be chosen for the left hand part with the box closed. In the beginning it helps to practice pieces like this in 3 part texture as well as hymns and other pieces in 4 parts one line at a time, slowly, about at half concert tempo speed. Practice this work slowly like this, one line at a time, starting with the right hand alone, then the left hand alone, then the pedal alone. When this gets easy, then, and only then, put 2 parts together, starting with both hands, right hand and pedal, and left hand and pedal. Since most of us are right handed, we typically find that the left hand and pedal part is weaker than the right hand and pedal part. The left hand part will require more practice than the right hand part. It helps to practice the left hand at the piano, using a Czerny etude or two, to develop strength and get the feel of playing a mechanical action organ, which offers a bit of resistance to the fingers and is very similar in touch to a piano. The keys of a mechanical (tracker) action organ run directly to the pipes and pull pallets; a certain finger strength is needed for this because there's a resistance in those pallets, especially with manuals coupled. With the Barker lever the work of pulling pallets was done by pneumatics which lightened the touch and allowed more manuals to be coupled together. When you've done this, you're ready then to put all 3 parts together. 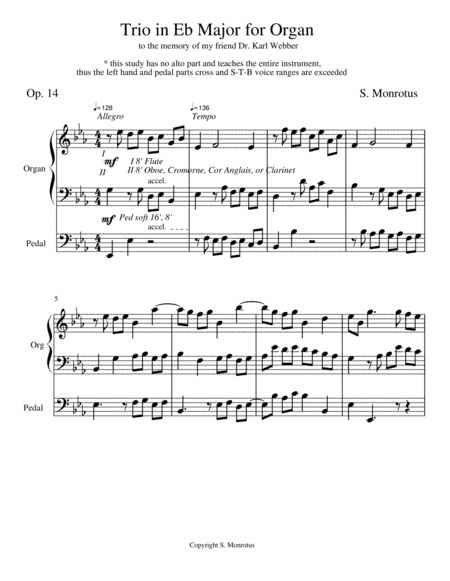 When trouble is experienced playing trios like this, or 4 part hymns, it's almost always related to the fact that the student has not gone through a period of slow practice one line at a time, then 2 lines at a time, before putting it all together. The thematic material in this work is 10 bars long and begins in the tonic key (Eb); it then moves immediately to the dominant (Bb) where the right and left hand parts are switched. You will note that the tonic (Eb) and dominant (Bb) are the only 2 harmonies involved in the presentation of the thematic material; it's entirely derived from only these 2 chords. Remaining in the dominant key, all 3 parts are then inverted [See blog, Inversion], the middle line remains where it is, and the top and bottom lines are switched. When you're checking the vertical harmony which these 3 upside down moving lines are making on the page, they could add together at times into a dissonant chord that has to be "fixed." As long as the lines aren't changed completely in the process, it's okay to change a note or two in these inversions to get things to "fit" tonally. Two different inverted moving lines in the hands could also pass too close to and wind up overlapping each other; space between them can be created by moving some of the notes to a higher or lower octave, which "tweaks' the line's shape but keeps it recognizable. These kinds of solutions are evident in this composition as well and are offered as examples. These situations at times confront us all and require the exercise of one's individual artistic judgment [See blog, Poetic License]. Four bars of episode (transitional) material follows which leads into the relative key (c minor), where all 3 lines are restated. After this, there is another 4 bar modulation to the key of f minor, the relative of the subdominant, where the parts for the 2 hands are switched again, this time in a minor key. This is followed by 4 more bars of transitional material which modulates to the subdominant (Ab), where the 3 moving parts in their usual positions are restated. A final episodic transition of 4 bars modulates from there back to the tonic key (Eb) where the 3 parts are restated in literal repetition of the opening. This is a tuneful piece which will keep the listener busy keeping track of the 3 parts; while the organist plays it, they're going to be busier. It's generally agreed that learning one piece like this will do more to develop independence in both hands and feet than anything else a student can try. It's good preparation for playing all contrapuntal music, not just Bach.